Need a hug? Well, in the near future, it might be a robot that’s offering that feel-good embrace. After all, robots are slowly but surely making inroads into many areas of our daily lives: they are collaborating with us in the office, flipping burgers, and passing medical licensing exams in order to assist nurses and doctors. So why not a robot specifically programmed for hugging? As the team points out in their paper, there’s a good reason to automate hugs. Recent research experiments have linked hugs to improved immunity, reduced stress and engendering a greater sense of well-being. The theory goes is that warm, fuzzy embraces will stimulate our body’s production of oxytocin (the so-called “feel good” hormone), which promotes a relaxed state, due to a decrease in the heart rate and a drop in the stress hormones like cortisol and norepinephrine. Working with this knowledge, the team wanted to create a hugging robot that could offer these health benefits by quantifying what distinguishes a ‘good’ hug from a ‘bad’ one. Surprisingly, the team found that it’s actually a lot harder to create the perfect hug than one might initially think. 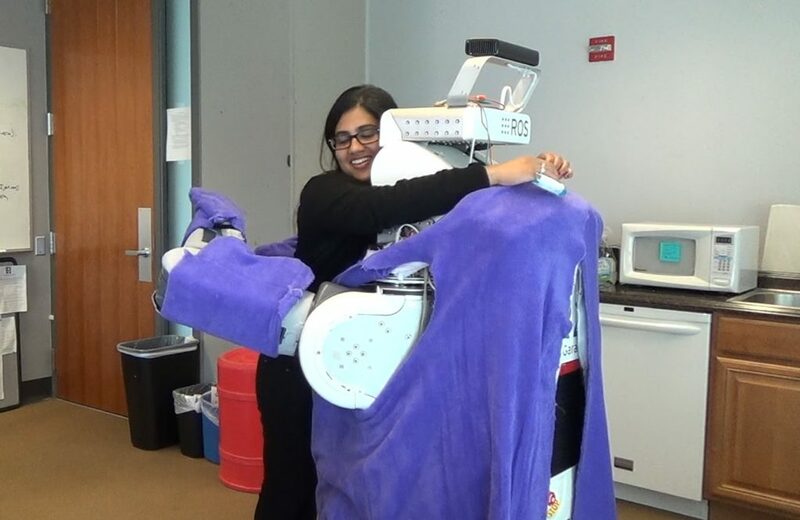 Using a modified PR2 robot, the researchers went through a variety of experiments with 30 participants to quantify a range of hug-related parameters. For instance, the team found that the positioning and pressure exerted by the robot’s arms is important in order to ensure comfort and eliminate unnecessary over-compression. Not surprisingly, the majority of test subjects also preferred when the HuggieBot’s hard body was softened with heated layers of foam, cotton, and polyester, allowing it to give warmer and softer hugs. As the researchers also discovered, the duration of the hug is critical: human participants disliked short, one-second hugs, and preferred slightly longer, tighter hugs, but expect a hug to terminate when they begin to disengage from the robot — a motion that is detected via a pressure sensor located on the back of the robot’s neck. As the team outlines in IEEE Spectrum, the aim now is to further develop the HuggieBot to incorporate haptic intelligence, so that it can glean more touch-based information from sensors. The researchers also hope to build a slimmer version of their hugging bot, with a screen for the face, so that a live image of a faraway friend or family member could be displayed, to create a personalized hug. In addition, AI for detecting emotional cues on people’s face could also be mixed in, in order to increase the robot’s ability to respond and adapt accordingly to someone’s mood in the present moment. Read more in the team’s paper.